For the BBA group, we are supposed to bake and post all the recipes in The Bread Baker’s Apprentice: Mastering the Art of Extraordinary Bread in order. Well, I baked the English Muffins and this delicious bread on the same day, and accidentally posted them out of order. My bad. I think I’ll have a slice of this fragrant, citrusy loaf to make myself feel better. Toasted. With butter. A double decker enriched bread, filled with nuts and dried fruit, this reminds me of the Eastern European breads that the Polish side of my family introduced me to when I was a child. I used half atta flour, buttermilk, as well as dried tart cherries because – you guessed it – I couldn’t find my cranberries. I also substituted 3 teaspoons of lemon oil for the lemon extract. If you didn’t know, lemon oil is a lot stronger than the extract, but I like it better because, to me, it doesn’t have an aftertaste that I often pick up in baked goods that use extract. My only mishap occurred during the final rise: the top braid fell off the bottom braid, lending a squat, toad-like appearance to what I had hoped would be a pretty bread. You should go to Natashya’s blog to see what a really pretty braided loaf should look like! And see those lighter colored areas in the cross section? That’s the atta flour that I apparently failed to mix in properly. Bottom line: Pure deliciousness. I really liked this bread, but would save it for the Thanksgiving or Christmas holidays. You can see what everyone is making this week at our Flickr group, on Twitter (#BBA), or check out the challenge page. This recipe also appears on Google Books. To see what others have been baking this week in the way of breads, be sure to check out YeastSpotting! I have had mishaps with the double decker ones too. Sometimes the other braid moves to the far side.. either way it is still delicious! You are a sweetie, Natashya. Thank you. 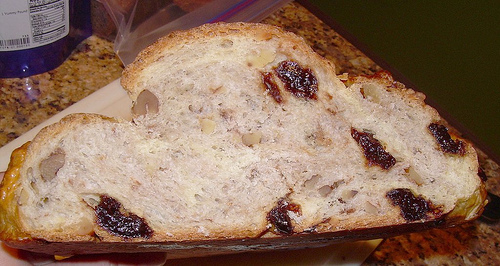 I think cherries are better than cranberries in bread. Perhaps, that is because I like cherries better. This is a bread, I could sink my teeth into. I think I’d like the cherries better too. It sure looks like pure deliciousness to me. I agree with Natashya. Your bread is a beautiful golden brown bursting with fruit. And believe me, at the end of the day its taste that counts with bread for me. Looks great! This one is up next for me. I do know where my cranberries are, but I think I’m going to use pecans instead of walnuts. Sorry your braid didn’t cooperate. 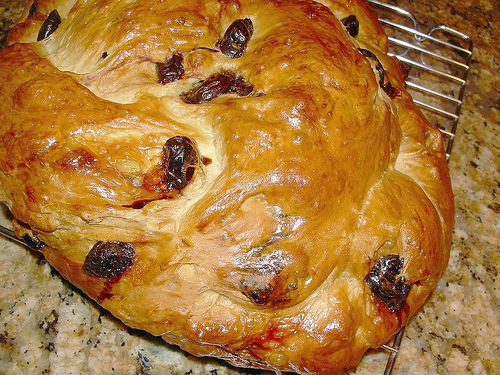 I see nothing wrong with a toad-looking loaf if it is delicious and you can eat the evidence! I loved this bread, even when the braid fell off and left me with a malformed loaf creature. I did, too, David – I thought it was delicious! Thank you for stopping by!